On arrival at Kolkata airport meet with our representative and transfer to the hotel. Overnight stay at hotel. Morning after breakfast full day city sightseeing tour of Kolkata visiting Victoria Memorial Hall - Howrah Bridge - Dakshineswar Kali Temple - Jain Temple - St. Paul's C. Church - BBD Bag, Swami Vivekananda's House - Missionaries of Charity etc. Overnight stay at hotel. After breakfast transfer to the airport to board the flight for Guwahati. Upon arrival at Guwahati airport meet with our representative and drive for the Rhino country, Kaziranga. 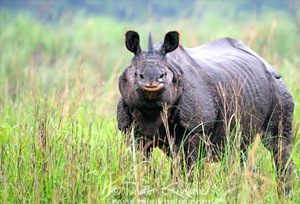 Located on the banks of the mighty Brahmaputra River in the far North East of India, Assam, with covering an area of approximately 430 sq kms, with its swamps and tall thickets of elephant grass, making Kaziranga National Park the ideal habitat for the Indian One-Horned Rhino. Due to limitless poaching of this prehistoric survivor, the Kaziranga National Park was declared a wildlife sanctuary in 1940. On arrival check in at the wildlife resort. Evening free at leisure. Overnight stay at hotel. Today will awake a little early with a wake call, half hrs before we will head for our morning elephant safari (05:30 am to 06:30 am), to the national park for wildlife viewing. Return back to resort for breakfast. After breakfast jeep safari (either central or western range). Return to lodge for lunch. After lunch jeep safari (if visited central range in the morning then western range or vice versa. Overnight stay at wildlife resort. Apart from the great one horned Indian Rhino, the other major wild attractions include a large population of Indian Elephants, Indian Bison, Swamp Deer or Barasingha, Hog Deer, Sloth Bears, Tigers, Leopard Cats, Jungle Cats, Otters, Hog Badgers, Capped Langurs, Hoolock Gibbons, Wild Boar, Jackal, Wild Buffalo, Pythons, Monitor Lizards etc. Today we will drive to the most beautiful parks of Assam, Nameri national Park covering an area of 200 Sq Kms nestled at the foothills of Eastern Himalayas. It is famous for the high density of elephant population. On arrival check into, camp. Evening explore the surrounding around the camp site. Overnight in camp. Nameri National Park covers an area of 200 Sq. Kms. With river Jia Bhoroli bifurcating the park, it is the most scenic of all the national parks of Assam. 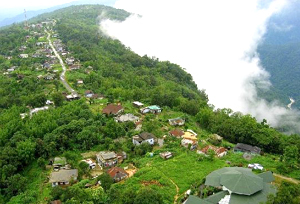 It's in the eastern border of Assam in the valley and mountainous Arunachal Pradesh, Nameri is home to some of the endangered species like white winged wood duck, Sloth Bear, Tiger Leopard, Clouded Leopard, Sambar, Gaur, Indian Wild Dog, four varieties of Hornbill and many other winged species. 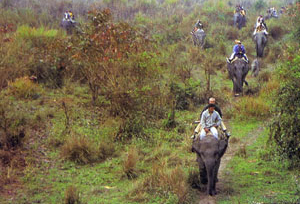 The other reason Nameri is famous for, is the herds of elephants. 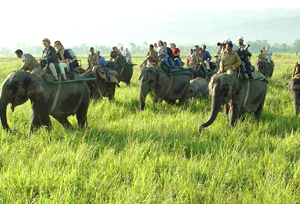 The park have a high density of elephant population and due to lessening of forest cover, they sometimes invade human inhabited villages, which have attracted the attention of wildlife conservationists worldwide. Day free for angling in Nameri. Jia Bhoroli river of Assam is famous for the Mahseer angling, since the time of British. This perennial river enters Assam in the plains, near Bhalukpong after swirling through the rugged mountains of Arunachal. Itis home of the Golden Mahseer - the Tiger of Indian Rivers and a catch for any angler. Overnight stay at hotel. After an early breakfast leave for Shillong. Have Lunch en-route in Guwahati. Further drive to Shillong via Umiam Lake, a majestic placid lake with its surrounding sylvan hills. Check in at your hotel. In the afternoon visit the local market. Stay Overnight at your hotel in Shillong. After breakfast drive to Cherrapunjee (60 kms 1 and 1/2 hr), the wettest place in the world. The beautiful waterfall - Noh-ka-likai is at Cherrapunjee you can also explore some of the caves in and around Cherrapunjee. Return to Shillong, en-route visit Elephanta falls and Shillong peak for some breathtaking views. Stay overnight at your hotel in Shillong. Morning sightseeing at Shillong, visit Ward Lake and Hydari Park. Admire the beauty of Shillong, also called Scotland of the East. It is erstwhile capital of undivided Assam and present Northeast and home to the Khasi highland tribes. After lunch drive back to Guwahati (100 kms). In the evening take a cruise on Mighty Brahmaputra River. Stay overnight at your hotel in Guwahati. Transfer to the airport to board the flight for Kolkata. Upon arrival at Kolkata airport meet with our representative and transfer to the hotel. Rest of the day fee at leisure or to explore the local market. Overnight stay at hotel.